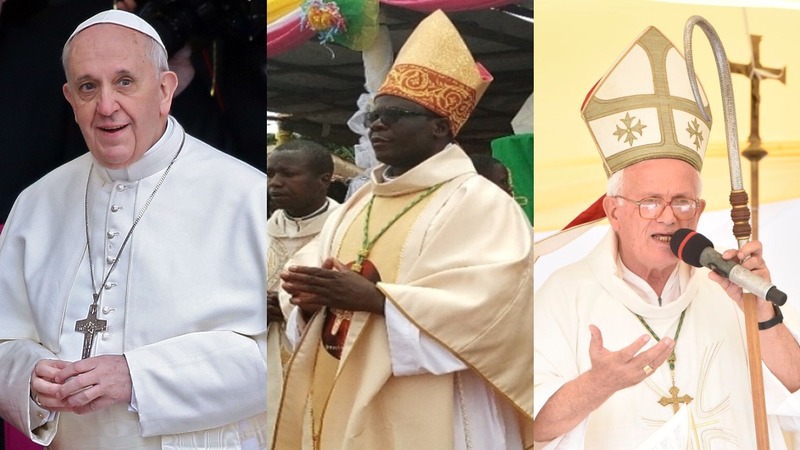 KAMPALA – Pope Francis has appointed Bishop Sanctus Lino Wanok of Nebbi, as the new Bishop of Lira, replacing Bishop Joseph Franzelli who has retired. 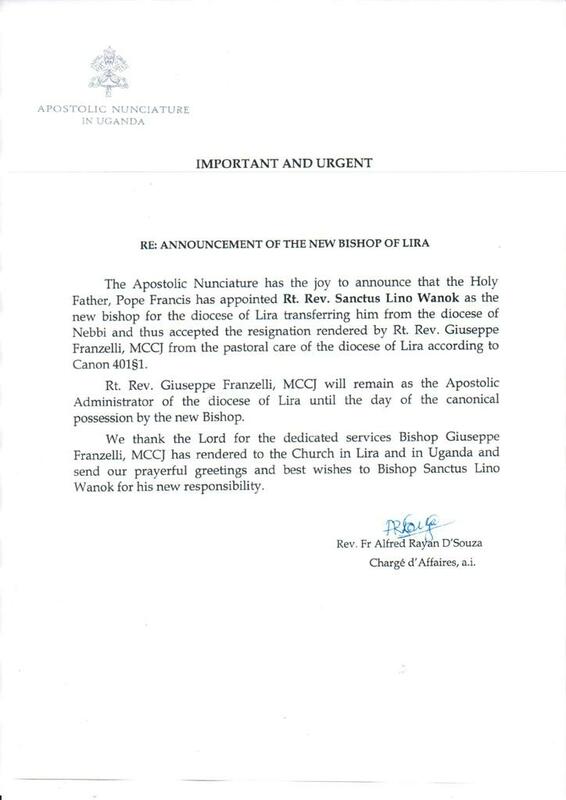 The announcement of the new bishop of Lira was made in Kampala on Friday afternoon by Msgr. John Baptist Kauta, the Secretary General of the Uganda Episcopal Conference. Bishop Franzelli, who hit retirement age on April 9 last year, will remain, apostolic administrator of Lira, until Bishop Wanock is installed, Msgr. Kauta said. The Rt. Rev. Sanctus Lino Wanok was born on 7th April 1957, at Ukuru Pamach village in Zombo district, West Nile region in Warr parish, Nebbi Catholic Diocese. He was ordained deacon on 31st August 1986 at Ediofe Parish and ordained Priestly on 27/09/1986 at Warr Parish by Bishop Fred Drandua. Bishop Wanok holds a Doctorate in Biblical Theology, obtained at Pontifical Urban University Rome between 1991-1995. From 2005 to the time of his election as bishop, he was the Vicar General of Nebbi Catholic Diocese. On 08/02/2011 the His Holiness Pope Benedict XV1 elected him as the third Bishop of Nebbi Catholic Diocese. Rt. Rev. Joseph Franzelli, MCCJ, was born in Roccafranca, Brescia Diocese, in Northern Italy on 9th April 1942.
made his final vows as a Comboni Missionary on 9th September 1966, and was ordained a priest on 11th March 1967. He taught at the Pastoral Institute of Kitgum, Uganda (1972-73) and in Lacor Seminary, Gulu (1974-75). From 1975 to 1982 he was the Rector of Kitgum Pastoral Institute. He then worked in Patongo, where he was Parish Priest up to 1987. Back to Italy, he served seven years as Master of Postulants in Florence and two years as Vice-Provincial in Bologna. From 1996 he directed the Comboni Year of Ongoing Formation, commuting between Mexico and South Africa, and helping in various administrative tasks in Rome until he was elected as the third Bishop of Lira. He was ordained in Lira on 9th July 2005.